0hMuch was made about who should replace Megyn Kelly on Fox News. Well, they found a replacement. 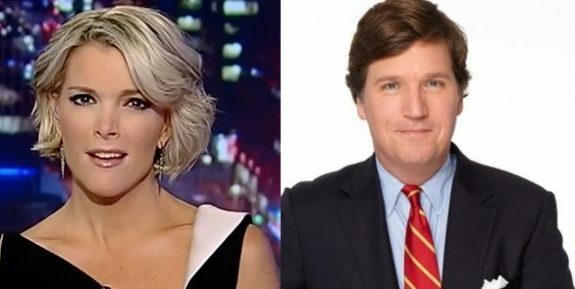 Tucker Carlson smashes Megyn Kelly’s ratings in the prime time slot. In his first week he was up over 27% of Kelly’s ratings in the same spot. Fox News’ Tucker Carlson got off to a roaring start in his primetime debut Monday night by easily outdistancing both MSNBC and CNN, proving at least for now that the decision to slide him into Megyn Kelly’s old timeslot was an excellent one. Carlson averaged 493,000 viewers in the key 25-54 demo, beating out CNN’s town hall special with Bernie Sanders (414,000) and The Rachel Maddow Show (324,000). Overall, Tucker Carlson Tonight averaged 2.699 million total viewers, nearly beating the combined total of MSNBC’s The Rachel Maddow Show (1.369 million) and CNN’s town hall special (1.357 million). Compared to Kelly’s numbers on the same day last year, Carlson was up 27 percent in total viewers and a whopping 45 percent in the key 25-54 demographic, showing that Fox News may not wind up missing Kelly as much as everyone thought.